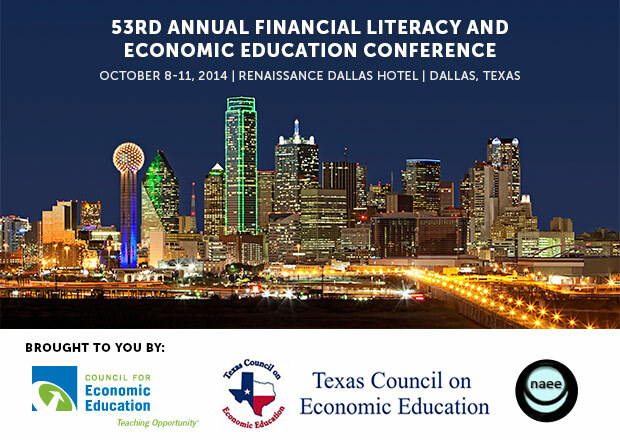 The Council for Economic Education’s 2014 Annual Conference in Dallas, Texas was a rousing success with 475 educators attending the Conference. Attendees included instructors from eight countries, 200 new attendees, and 250 K-12 teachers from 34 states. Conference goers were able to hear talks from top economists such as Richard W. Fisher and Alan B. Krueger. Fisher, the President and Chief Executive Officer at the Federal Reserve Bank of Dallas, spoke at the Teacher Recognition Luncheon on the importance of education and his perspective on the robust growth of regional economies. Later that day, Krueger, a Bendheim Professor of Economics and Public Affairs at the Wilson School at Princeton University, spoke to attendees about the financial crisis of 2008-09 through the lens of behavioral economics. 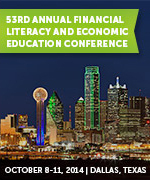 CEE’s Annual Financial and Economic Literacy Conference kicks off in Dallas this Wednesday, and the media is already starting to buzz about our exciting speakers and sessions. 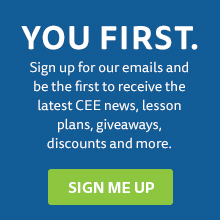 The Dallas Morning News spoke with our CEO and President Nan J. Morrison and Laura Ewing, chief executive of the Texas Council on Economic Education, about the importance of teacher training to improving students’ financial literacy, and what we are doing to move the needle. Click here for the full article.